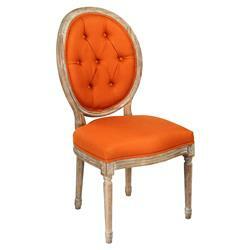 Brighten your room and outlook with this warm orange linen tufted oak chair. A limed grey finish details the intricate woodwork on the legs and frame. The luxuriously cushioned back invites guests to relax and enjoy their stylish surroundings.